IT professionals are hard to find. So how can you build more reach so that you are found by those in the IT sector? In this article we want to show you how SEO can help you recruit more IT professionals. SEO is an important point in recruiting today that you should definitely have on your agenda. Currently, there is an active search for jobs taking place in search engines including Google, as well as job search engines and job boards. There are a variety of different terms used to search for each job. You should be aware of the relevance of different keywords, on the findability of your job advertisements and the ranking of your ads. It should be clear to you that different keywording also leads to different results in the search. Search engines work according to simple factors that determine the rankings. Active seeking candidates are the easiest to recruit. However, if you use an incorrect job title for a job posting, you will not receive any job applications. Using the wrong job title means that your target group either doesn't know or isn't looking for that specific job title. Even the best communication, the simplest processes and the most attractive company can't help you in this situation. Before creating each job advertisement, you should ask yourself what the relevant keywords are for your target group. If you are looking for Keyword A, what would the target group be looking for? It's also a good idea to advertise multiple ads with different keywords or job titles to get more reach in your audience. 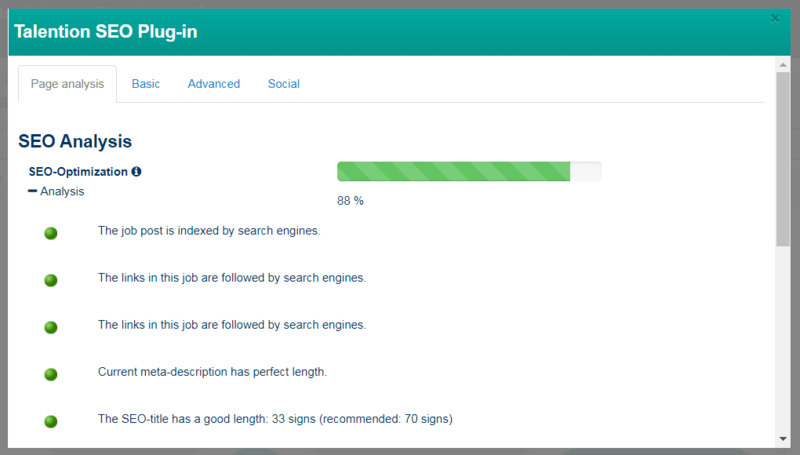 In our job ads, we offer a tool that will give you keyword suggestions and show you where to optimize your job listings. SEO is an important topic to reach active candidates. You should not miss this potential. The recruitment of passive candidates is five to six times more expensive and much more difficult. Are these topics still too abstract for you? Would you like to see more specific examples from your industry? We would like to show you best practice examples and concrete implementation in the Talention software. Just ask for a free demo here and someone will get in touch with you shortly. Request a demo now.